This year, instead of making a cute dress, I finished a lacy top just in time for my birthday. It’s been a week, but the usual work overload, daily rehearsals and a challenging concert last Sunday, haven’t been exactly favourable to blogging. The design’s name is really Bell Sleeve Pullover, but “Belle Sleeves” sounds much more fancy, don’t you think? The pictures were taken at my parents’, in le Nord. Hence the typical yellow bricks. The design is by one of my favourite designers, Doris Chan. For anyone interested, it is available for free. The only thing I changed was adding a few more rows to the body. I also crocheted the bottom rows and the sleeves’ bells with a 5.00-mm crochet hook, to add a bit more flare. I didn’t add any extra rows to the sleeves. Sigh… Love the sleeves! Especially the edging, with the picot and fans. This turned out much prettier than I was hoping: nothing to do with the pattern, but I wasn’t too happy with the yarn’s texture. I was also afraid it wouldn’t be comfortable to wear as the yarn didn’t have much give at all, but as it turns out it’s fine. The yarn is Rigato, by Austerman. It is a single colour, but is self-stripping through the variation in texture – from matte (linen) to shiny (rayon). I love wearing this top – wearing black lace is truly a special feeling. 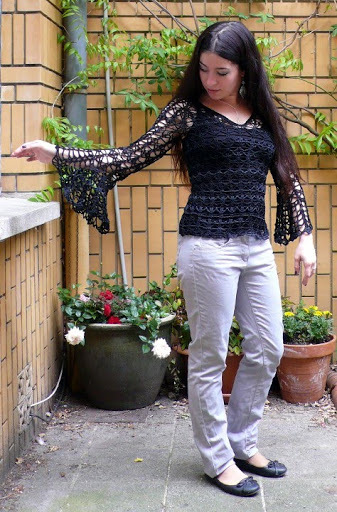 This wasn’t the first time I made a black lacy top, and I can’t promise it’ll be the last, either. Joyeux anniversaire ! Love, love, love your très belle pullover. And bon courage with the end of the school year stuff and moving. WOW, looks great. very romantic. That was a lot of work, he? Beautiful! I'm going to hoard the pattern, and maybe someday I'll break down and learn how to knit/crochet so that I can make something like this. Oho how lovely. 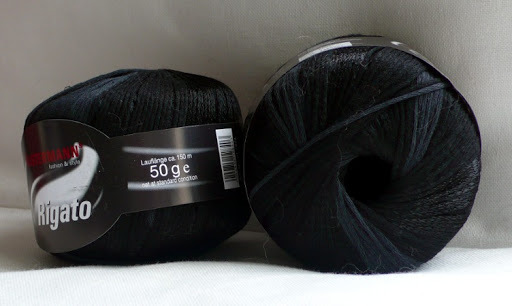 The lace effect of the corchet is very pretty and it fits nicely. I love the sleeves! Good luck with the new apartment. Happy birthday! It's gorgeous and so classic! You're going to love having a dedicated crafting room in your new flat – it's SO nice to be able to leave projects out and pick right up where you left off later. Congrats on finding a new apartment with a bit of garden. And a craft room! That would cheer up my spirits immensely, and I hope it does for you too. I wish, wish, wish I could crochet and knit! Happy Birthday! I love doris chan, she's one of my favorites. You have a lovely blog Isabelle and an even lovelier cat! Greetings from sunny Florida btw! Supercute top! You look smashing and happy belated birthday! It's a beautiful top! I love the sleeves too! Congratulations on moving to a bigger place! WOW! !gorgeous top!! !I also like your previous projects.So elegant and sophisticated. Beautiful! It is perfect for you. Happy Birthday! I am sure you and your lovely kitty will enjoy the new, larger space, too. Beautiful sweater! Having a two bedroom flat is heaven. I looooove my sewing room. Your moving plans sound so exciting, Isabelle! 😀 I'm so glad you'll have a larger, quieter place with a garden for the kitty. Your sweater is stunning. I really, really love it. And please accept my late but heartfelt birthday wishes!! How exciting to have the extra space! And your top is so gorgeous – very Morticia Adams! What an amazing top! It's gorgeous. congrats on the new flat! Moving again, you're getting experienced! Good to hear you'll have more space. Good luck with all the year end hassle, hope you will have more time to sew after that. Ce petit haut dentellé est simplement magnifique, et j'adooore les manches moi aussi ! Bon courage pour le prochain déménagement, quelle joie d'avoir un bout de jardin et une pièce toute dédiée à tes passions ! Je t'embrasse bien fort, une caresse à Little Miss Fluffy ! Oh it is gorgeous and just in case you didn't get my email. Wishing you once again a happy birthday. All the best with the new flat you certainly deserve a big one with a working space of your own. This pullover is absolutely gorgeous, fantastic, wonderful! I LOVE IT!!! I saved the pattern, and I might just make this top too! You look amazing, my friend! that is simply gorgeous! it looks fabulous on you. J'adore la forme de ce top, les manches, c'est superbe!! Bravo pour ce superbe gilet tout en dentelle, il est magnifique. Coup de coeur pour la jupe Simplicity 2655, j'ai acheté le patron…à suivre. Beautiful birthday gift to yourself.